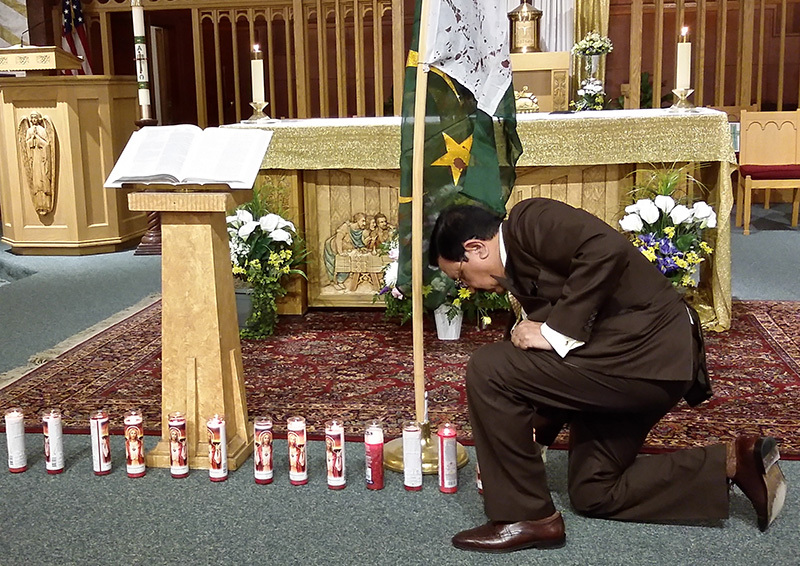 Following a recent series of deadly attacks on Christians in Pakistan, members of the Philadelphia Archdiocese’s Pakistani Catholic community gathered for a prayer vigil April 21 at St. William Parish in Northeast Philadelphia. More than 40 attendees prayed in both English and Urdu, led by Father Tariq Isaac, the chaplain of the archdiocesan Pakistani Catholic community. On April 15, two young men were killed as gunmen opened fire on a group of Christians standing near a church in Quetta, located in southwestern Pakistan. On April 2, the day after Easter, a Christian family of five was shot while riding in a rickshaw; four adults were killed, and a young girl was injured. ISIS claimed responsibility for the attack. Shamoon Bashir, a member of Resurrection of Our Lord Parish in Philadelphia, lost his uncle and three other family members in the April 2 shootings. Victor Gill, a freelance journalist and longtime advocate for Christians persecuted in his native Pakistan, noted there were several identifiable stages to the escalation of religious intolerance. Gill added that the ongoing violence in Pakistan could not ultimately be resolved by mere human means. “It takes a God,” he said. During the evening’s reflection, Justin Sharaf of St. William Parish noted that religious tensions have long plagued Pakistan, a predominantly Sunni Muslim nation formed in 1947 when British India was partitioned. Christians, Hindus and minority sect Muslims (such as Shia and Ahmadi) in total represent just 4 percent of the nation’s population, which is currently estimated at approximately 200 million. Pakistan’s blasphemy laws, under which any insult to Islam may be punishable by death, have been increasingly criticized for unfairly targeting believers from minority faiths. Siser Rose Patrice Kuhn, I.H.M., observed that the April 21 prayer vigil “was part of Pope Francis’ call to share the journey” with migrants and refugees. At the end of the service, attendees silently placed lighted candles in front of a flag of Pakistan that had been symbolically streaked with red to represent the blood of martyred Christians. A “Quetta Martyrs Fund” has been established to assist the families of Christians killed in Pakistan. For more information, contact Shamoon Bashir at 267-439-2368 or Haroon Bashir at 215-954-7836.